The 20th child born to Alonzo Lester Loftin (and15th child of Ida Lillian Setzer) was an "Infant Son" who was born 26 Oct 1922 in Catawba, Catawba County, NC. The Index to Vital Statistics of Births in Catawba County, NC, shows that Alonzo and Ida Loftin gave birth to a "boy" on "10-22-22". The child would have been born in the family home with Dr. Fred Long of Catawba delivering the baby. Since there was no actual birth certificate given when the child was born, the baby's birth would have been registered at a later time. It's unlikely that this infant boy was born on 22 Nov 1922 - the day of month of his older brother Oscar. It is more than likely that whoever reported the child's birth inadvertently gave Oscar's birth day and month instead. The Death Certificate for "Infant" Son Loftin shows that his death date was 27 Oct 1922. 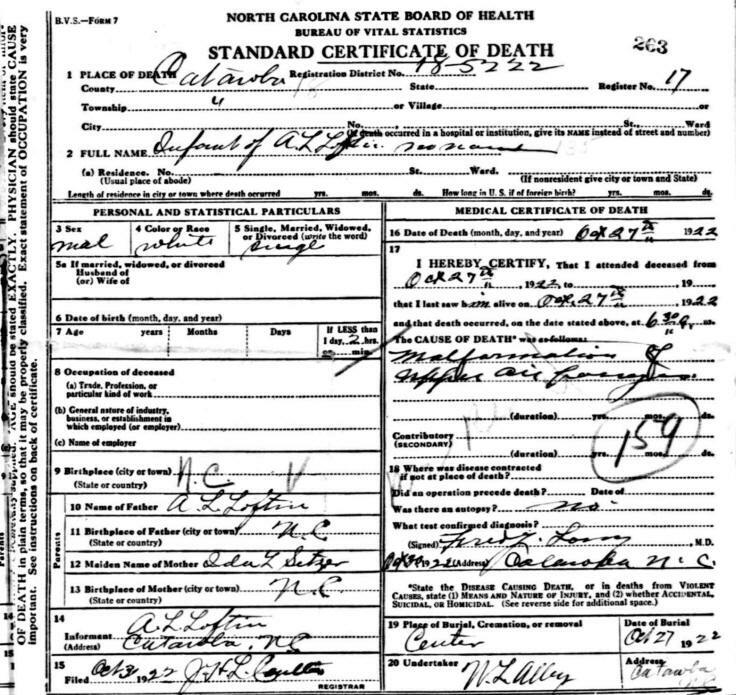 The Death Certificate further states that the child was "Less than 1 day and 2 hrs" old at the time of his death - indicating that his actual birth date was 26 Oct 1922, instead of 22 Oct 1922 as the Birth Index shows. The cause of death listed on the Death Certificate was "malfunction of upper air passage". The Death Certificate also shows that the child was buried at Center Methodist Church. As of 29 Nov 2014 I've been unable to find a grave marker for this child at Center Methodist Church in Catawba, NC, where his parents and other infant brothers were buried. There are grave markers for infant sons born in 1908, 1914 and 1928. If you have additional information about the Loftin Family of Catawba County, NC, please contact me.